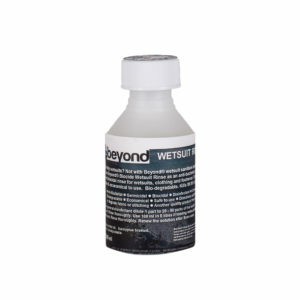 Beyond Wetsuit Rinse – formulated because we hated the smell of damp, bacteria ridden wetsuits and shoes we left in the car or where we dumped them by mistake! 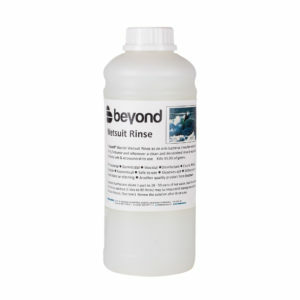 A safe biocidal, fungicidal, 100% biodegradable concentrated liquid, Beyond Wetsuit rinse kills 99.9% of germs. This harm-free earth-friendly biodegradable product does not contain phosphates (which stimulate excessive algae growth), EDTA, chlorine, enzymes or chemical plasticisers. Stop that wetsuit smell and make that early cold surf a pleasure…. Anti-Bacterial – Germicidal – Biocidal – Disinfectant -Cleaner -Bio-degradable – Economical – Safe to use – Dissolves salt – will not rot or degrade fabric or stitching. For general disinfectant dilute 1 part to 20 – 50 parts of hot water. Soak for one hour. Rinse well in fresh water. 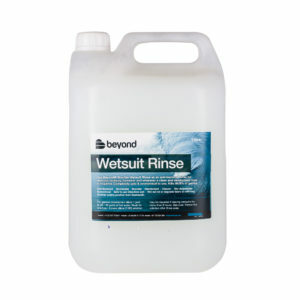 A more dilute solution (1 litre to 60 litres) may be required if leaving wetsuits for more than 8 hours. Renew the solution after three or four uses.